In 1972 a crack commando unit was sent to prison by a military court for a crime they didn’t commit. These men promptly escaped from a maximum security stockade to the Los Angeles underground. Today, still wanted by the government, they survive as soldiers of fortune. If you have a problem, if no one else can help, and if you can find them, maybe you can hire The A-Team. That’s how my favorite TV show of the 1980’s started each week. In those dark days before VCRs and DVDs (well, we did have VCRs but I’m trying to be dramatic here) if you had a favorite TV show you had no choice but to be home to watch it or miss out the next day when everybody was talking about it. And I made sure I was home every Tuesday night when “The A-Team” was on. The show had a simple premise which you just read five sentences and two spaces up. “The A-Team” worked because of the quirky relationship between the four members of the team, played by George Peppard, Dirk Benedict, Dwight Schultz and Mr. T. In the four years the series ran, these guys convinced me that they were an unbeatable unit, bonded together by loyalty and brotherhood. Despite their wildly different personalities, at the core they shared the same values and morals. The A-Team proved time and time again that they were indeed a team in every sense of the word. And that’s probably why it took so long for the movie version of THE A-TEAM to come to the screen. It was necessary to find four actors who could recreate that same chemistry. Because if you don’t believe in the bond between these four guys then you’re not gonna believe they’re The A-Team. 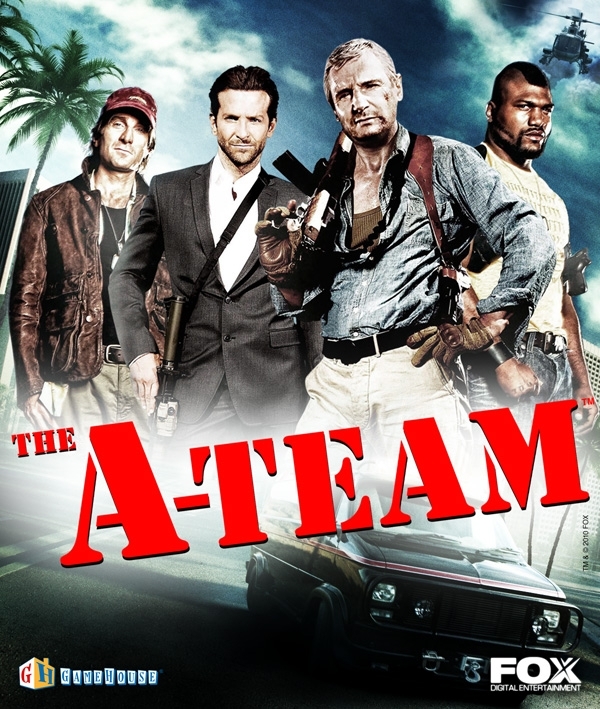 The movie version of THE A-TEAM shows how this bond started because it’s an origin story, clearly intended to set up the premise for a possible franchise and given how much I enjoyed the movie, I really hope there’s a sequel in the works because while this isn’t a movie that will never be mistaken for an Academy Award winner it is what I think a lot of people go to the movies for: solid entertainment worth the money and time paid. The team first meets when Colonel John Hannibal Smith (Liam Neeson) is on a desperate rescue mission to save his protégé Lt. Templeton ‘Faceman’ Peck (Bradley Cooper) from a renegade Mexican general. It’s during this mission that Hannibal meets Master Sergeant Bosco ‘B.A.’ Baracus (Quinton Jackson) and enlists him to help in the rescue. They make their escape in B.A.’s souped up GMC Vandura van to a mental hospital where they hook up with the pilot who’s supposed to fly them to safety: Captain H. M. ‘Howlin’ Mad’ Murdock (Sharlto Copley) Murdock is certifiably insane but he also happens to be one of the best pilots in the world as he proves when he out flies two helicopter gunships pursuing them during their escape. The four men become a highly respected and highly feared elite combat unit during The Iraq War and are recruited by CIA Special Agent Lynch (Patrick Wilson) in a Black Operation to steal U.S. Treasury plates being used by Iraqi insurgents to manufacture counterfeit money. Hannibal is warned by his commanding officer and best friend General Morrison (Gerald McRainey) and Face is warned by his ex-girlfriend DCIS Captain Charissa Sosa (Jessica Biel) that the A-Team should stay away from this job. Now you might think that THE A-TEAM would suffer after we’ve seen a similar kind of plot in “The Losers” but THE A-TEAM has a totally different vibe and tone. Liam Neeson, Bradley Cooper, Quinton Jackson and Sharlto Copley channel the spirit of the actors who played these roles before them but put their own spin on them. There were plenty of moments when I had a really weird feeling I was watching the TV show, just blown up bigger. Liam Neeson is really having a good time here. Hannibal Smith isn’t a master of disguise in the movie as he was in the TV show but he’s still the consummate strategist and planner. One of the neat things about the movie is that it shows the mentor/protégé relationship between Hannibal and Face to the point to where it really counts; Hannibal lets Face design the plan that will hopefully save the team from life in prison. I understand that Quinton Jackson is an ultimate fighter and I’ve never seen him in anything else but it was truly scary the way he channeled Mr. T in his performance as he actually sounded and moved like Mr. T. And B.A. has really good character arc in this movie that gives a reason why B.A. wears a Mohawk and why he’s so scared of flying. Bradley Cooper I knew only from “The Hangover” and I loved in him that and if there’s any justice this movie should make him a star. Like everybody else, he manages to channel the spirit of the actor who played the role before him. In this case, Dirk Benedict, while making the character of Faceman his own. He’s just great. As is Sharlto Copley. His performance as H.M. Murdock is so dead on its scary. It’s as if Dwight Schultz is right there in his ear whispering as how to play the character. But surprisingly enough, it’s the action scenes in this movie that really gave me a headache as Joe Carnahan seems to have drunk from the same Kool-Aid as a lot of Hollywood directors who simply refuse to film action scenes coherently. Why won’t they simply put a camera down, leave it there and let the stunt people do what they’re hired for? For a movie like THE A-TEAM, clarity of action is essential. But I got to admit, the last fifteen minutes of the movie are jaw-droppingly astounding in the sheer destruction that results. As it should be when The A-Team is involved. And then there’s the scene where The A-Team is stuck inside of a tank that’s fallen out of a plane and with no other option left to them have to attempt to fly the tank. Yeah, you read that right. Jessica Biel…ah, I wish I could say more than she was just the obligatory female love interest but I can’t. Not that I don’t dislike Ms. Biel. But I don’t like her either. She’s an average actress and she fulfills her part adequately and that’s it. But THE A-TEAM really isn’t about a love story between a man and a woman. She’s just there to help the plot along. THE A-TEAM is a love story about four men who like danger, excitement, adventure, beating impossible odds and loving it when a plan comes together. If you’re a fan of the TV show then you won’t be disappointed in the movie incarnation of THE A-TEAM. And here’s a hint for those of you who reach for the remote to eject the disc the minute those end credits you hate so much start to run: you’ll miss a really nice Easter Egg. And before you leave this review, give a listen to the full A-TEAM theme song. I love it when a review comes together. I was highly disappointed to hear earlier on this evening that according to Bradley Cooper there will not be a sequel. The movie made money but not enough, according to the studio.